Hey kids! 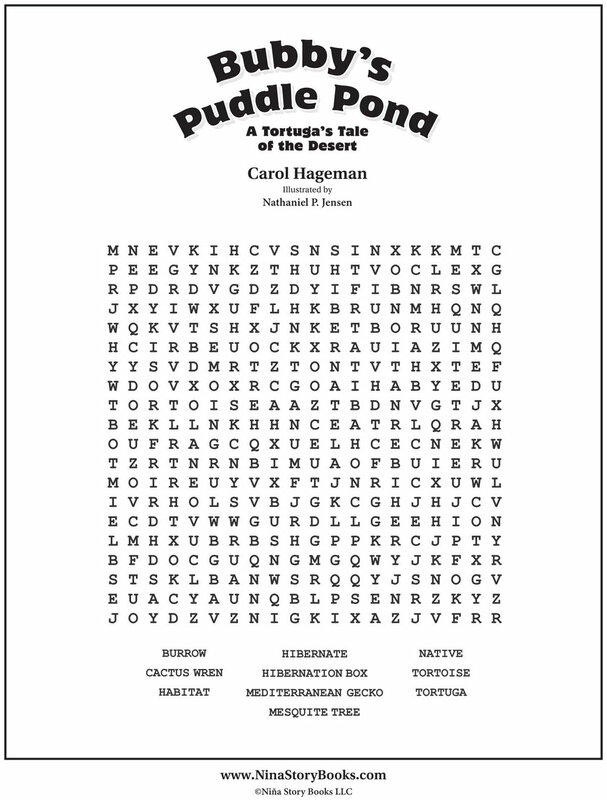 In Bubby's Puddle Pond, a desert tortoise named Bubby learns how to trust his friends and himself. Want to learn more about the desert tortoise? Here are some fun activities for you to try! Make sure you get an adult's permission first. After toasting the waffle, cut off the bottom 1/3rd of the waffle and set aside. Place the large portion on a plate. Take the bottom 1/3rd and cut into 4 pieces for the legs. Position the leg pieces closely to the bottom, flat, large portion that is on your plate. Next, peel a banana. Use the bottom end of the banana for Bubby’s tail. Cut the piece in half so it will lie flat when you place it next to the large piece of waffle on the plate. This should be on the left side. Cut the top end of the banana about 3 inches long. Then, cut the 3 inch piece in half, lengthwise, so it will lie flat on the plate. Place it on the right side of the waffle on the plate, curve up so that Bubby is looking up at the banana snacks. He loves bananas! Cut 3 banana pieces (or as many banana pieces as you wish) and place above Bubby. Lastly, add 1 mini chocolate chip for Bubby's eye and also in the center of each of the banana rounds. Enjoy your Mr. Tortuga Breakfast Waffle! Download and print any of Bubby's activities for FREE! Here is a new word to learn biome (bī-ōme). A biome is an environment with specific plants and animals. Most of the southern area of Arizona is the biome called desert. If we traveled to the ocean shores, that biome is called mediterranean. The ocean is called the marine biome. Each biome has different temperatures and humidity which means there are different plants in each biome. The different plants, temperatures and humidity mean that there are also different animals. Animals are most comfortable living at certain temperatures and they eat specific food. Can you do some research to find out what plants a desert tortoise eats? If you were on a boat on the ocean, you could find a relative of the desert tortoise living in the ocean. What animal would that be? What does this desert tortoise’s relative eat? Make a chart to compare the food they each eat.